Create whole new levels of detail within your 1:32 scale Flying Sub™ from Moebius Models™. This exhaustively researched set provides every single button, switch, and speaker in this kit's interior. Through holes make it easy to accurately light the sub's control panels. Easy to install: simply scythe off raised kit detail and glue the etch panels into place. Since the panels are solid metal, you don't have to worry about getting a perfect finish when removing the kit detail. Also includes handles for the bunk wall cabinets, steps to the bunk (based on original studio blueprints), and the hook for securing the egress ladder in the stowed position. BONUS: Self-diffusing backlightable panels are included for the three display screens. These backlight panels make it easy Multiple designs for each display are provided (see the image below) so you can customize your sub to a particular "mission". 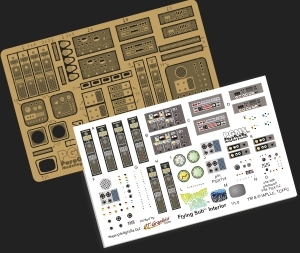 This decal set is specially designed to work with the Flying Sub™ Interior Photoetch set. Make short work of detailing the interior and provide a professional finish that can't be beat. Each button and detail has been researched to ensure the ultimate in fidelity with the original Voyage to the Bottom of the Sea™ set. Simply paint the overall interior colors and apply these decals and ... you're done! Includes metalic inks for that extra measure of realism. As always, our decals are ALPS printed by JT Graphics, the leader in aftermarket decals. Builtup photos courtesy of Iain Costall. View more images of Iain's sub here.